This is the year to plan an unforgettable weekend getaway to Southern Indiana. 2018 marks Lawrence County’s Bicentennial. The rich history, unique terrain and limestone heritage are the cornerstones of the region’s modern communities. Many Bicentennial events are planned throughout the year to celebrate this history, including Lawrence County Bicentennial Dinners in the Grist Mill. Enjoy a one-of-a-kind dinner experience in the Pioneer Village. The historic Grist Mill transforms into a dining hall with a meal catered by Spring Mill Inn. The limestone’s large, rustic space is outfitted with historic machines and knick-knacks. The limestone Grist Mill was constructed in 1817 near Mitchell, Indiana. The mill ground grains, such as corn and wheat, into flour. The waterwheel was powered by a constantly flowing stream that runs through the village. The success of the mill led to the development of the thriving village around it. 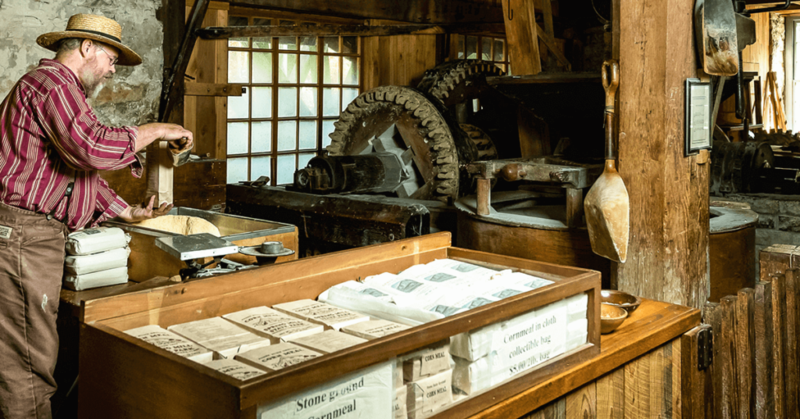 In the early 1900’s, the Grist Mill and Pioneer Village were restored. The lower level is a functional mill and the upper level has period displays and historic items. From May to mid-October, the village bustles with pioneers demonstrating period crafts and telling their stories. You can even take home fresh cornmeal that’s been ground in the mill. Make it a vacation at Spring Mill State Park, by staying overnight at Spring Mill Inn and exploring some of Indiana’s best hiking trails and caves. The cost of the dinner is $50 per person. Reservations are required because space is limited, so call 812-849-4508 to reserve your place. To read more about Lawrence County’s history, click here.